R. S. Thomas (1913-2000) teemed with contradictions: a passionate advocate of Welsh nationalism he wrote in English and sent his son to boarding school in England; an undemonstrative man he composed the most tender elegies for his wife; a man of devout faith who all his life experienced the elusiveness of God; a poet who hardly ever left the narrow confines of north Wales but who at his death was hailed as a major European poet. This "troubler of the Welsh conscience" (Professor M. Wynn Thomas) was born in Cardiff, the only child of Huw, a captain in the merchant navy, and Margaret. In 1918 the family moved to Holyhead for his father's work. Thomas grew up in an English-speaking household, only learning Welsh when he was thirty, a major cause of regret as he didn't feel fluent enough to write poetry in his native tongue. He studied Classics at the University College of North Wales, Bangor and then undertook his theological training at St. Michael's College, Llandaff, being ordained as a priest in the Anglican Church of Wales in 1936. 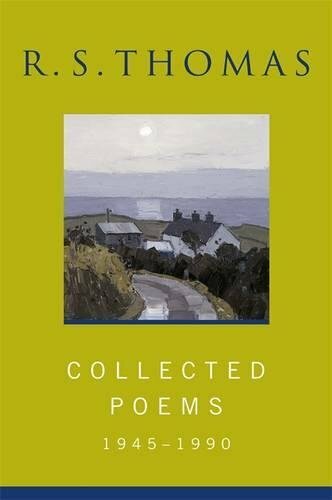 From then until his retirement in 1978 Thomas's ministry took him to a number of rural parishes in North Wales: the bleak beauty of the landscape and the hard lives of the peasant farmers became abiding themes in his poems. In his first post in Y Waun, Denbighshire, he met his future wife Mildred (Elsi) Eldridge who was an English artist. Though they often seemed remote from each other (no one can recollect seeing them touch in public) their marriage proved as enduring, lasting fifty one years until Elsi's death. They had one son, Gwydion, born in 1945. Thomas published three volumes of poetry before his breakthrough to a wider audience came in 1955 with the publication of Song at the Year's Turning. In his famous introduction John Betjeman wrote "the name which has the honour to introduce this fine poet to a wider public will be forgotten long before that of R. S. Thomas." Thomas wrote over 1,500 poems in his life and although there were developments in subject and style - from the early poems rooted in the physical realities of place to the more abstract and metaphysical investigations of his later work - his poetry was consistent in its seriousness of purpose. In Thomas's eyes the modern world with its technological conveniences was a dangerous distraction from our spiritual existence. Sometimes this aversion to the 20th Century could take on Luddite-like proportions - Thomas's son recalled sermons in which his father railed against fridges and washing machines - but Thomas certainly practised what he preached, living an extremely ascetic life. The language of the poems reflects this: the words are simple and spare, the lyric voice often fierce but capable of a kind of severe compassion and a prophet-like intensity. Thomas's uncompromising vision continued to attract admiration: in 1964 he won the Queen's Gold Medal for Poetry and in 1996 was a Nobel nominee (losing out to Seamus Heaney). Thomas died after suffering heart trouble at the age of 87. There was something in Thomas of the "voice crying aloud in the wilderness", the loneliness of a man socially isolated form his parishioners by his education and from the contemporary world by his temperament. But this sense of isolation is what makes his poetry "very pure, very bitter" (Al Alvarez) like the Welsh landscape he knew so well. Both the poems featured here reveal Thomas's ambivalent relationship towards Wales. On the one hand a political extremist who refused to support Plaid Cymru because they recognised the English Parliament, Thomas could also be coruscating in his criticism of the Welsh people and what he saw as their abandonment of their own culture. In 'The Ancients of the World' Thomas's haunting litany of the beasts of Welsh mythology looks back to bardic tradition, but the language he uses suggests a cold and deathly legacy. 'A Welsh Testament' sees Thomas on more overtly political form speaking in contemptuous tones to those English tourists who want to turn his country into a "museum". However, he is also resentful of the limitations of a life lived with "the absurd label/of birth, of race hanging askew/About my shoulders." The contradictions of the poem are given an extra resonance when you hear Thomas reading in the weary tones of an upper class Englishman. At first the disjunction feels problematic, but perhaps it's only a true reflection of this complex man that whilst his words express his unity with Wales, his accent points to his alienation from it.